It is the mission of the Town of Brookfield Police Department (TBPD) in partnership with our community, to consistently seek and find ways to affirmatively promote, preserve, and deliver a feeling of security, safety, and quality of service. Municipal court is held the first and third Thursday of each month starting at 5:30 pm. Contact the court at 262-796-3780 or write to Municipal Court, 645 N. Janacek Rd., Brookfield, WI 53045. You can also e-mail the Court Clerk with questions about court-specific issues, how to get to the court and what to expect when you're there. If you are coming to court, check out the Court Procedures Handbook for information on what to expect on your court date. Go to the Municipal Court webpage for further information, forms, and frequently asked questions. 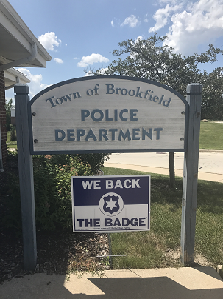 We Back the Badge Signs are available at the Town of Brookfield Police Department. 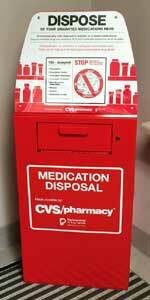 Check out the information for the new Drug Collection Unit to be installed at the Police Department. The Town of Brookfield Police Department has released the 2016 Annual Report for your review. 2017 Annual Report will be available in January.